Withdrawn in a corner of the room, BREATHING CLOUD rhythmically oscillates between floor and ceiling. 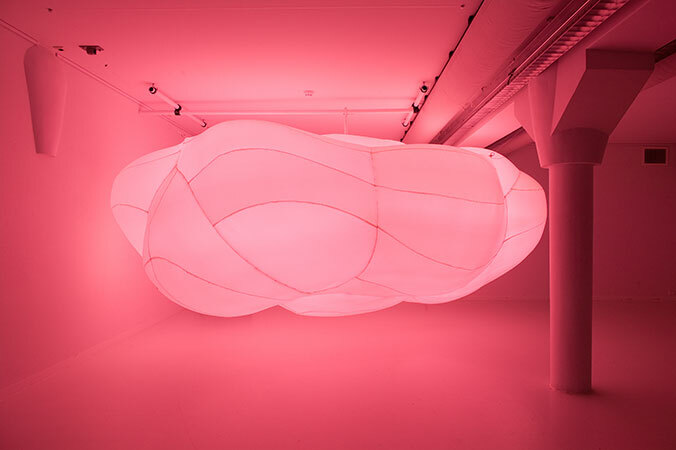 The huge, floating, amorphous shape invites closer scrutiny. The slow but sure movements of the diaphragm are accompanied by deep bass tones. They reinforce the idea that BREATHING CLOUD fills the space like a living, apparently sleeping organism with its intense breathing. Opening: Friday September 11, 2009, 5 p.m.
See what sakura snow (a freelance designer and illustrator) tells about my work.